I did enjoy this book - even though I rather suspected the twist in the tale less than half way through. 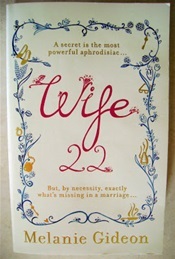 It's a warm-hearted book, full of likeable characters, especially Alice - the Wife 22 of the title - struggling to make sense of life, marriage, children, job and ambition. On the back of the book there is a quote describing it as "a wonderfully clever, sad and funny read." I am inclined to agree. Alice's mother died when she was 45 and Alice herself is approaching this landmark birthday. She refers to it as her "tipping point year", the time when she becomes the same age her mother was when she died. It has made her reflect on her life as wife to William, mother to Peter and Zoe, drama teacher to the youngsters at Kentwood Elementary School. When an invitation appears in her in-box to take part in a major survey on married life, she is sufficiently intrigued to accept. So she becomes "Wife 22" in the anonymised terms of the research centre, responding to a stream of questions asked by "Researcher 101." As Alice's answers become more and more honest and detailed, the reationship between researcher and subject develops into something much deeper. There are lots of laugh-out-loud moments in the book and some very well-drawn pictures of family life. I loved Alice the mother, particularly her relationship with son Peter. Alongside the humour are some poignant scenes as Alice recounts the early days of her relationship with William and meets up with a group of friends who all lost their mothers as children. The book is peopled by an excellent cast of supporting characters, from best friend Nedra to the appalling mother of one of the children Alice teaches. Only William remains a bit of a mystery, coming alive through the passages in Alice's responses to Researcher 101's questions. I felt for Alice the writer, who lost her way as a playwright when she suffered biting reviews to her first stage play. Through her answers to the survey, Wife 22 finds her writing talent again. But what about her marriage? I won't spoil the ending! 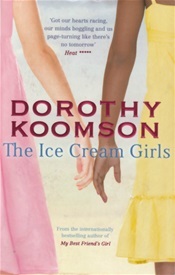 After watching the television adaptation of Dorothy Koomson's novel, I was keen to read the book - not least because I was aware, from an interview on the radio and reports back from a WI meeting where Dorothy Koomson was the guest speaker, that she was extremely unhappy with the changes which the TV directors had made to her story. I could understand why, because even the killer had been changed in the TV version, and the emphasis on domestic violence, something the author feels very strongly about, was minimised. Some changes made sense, I thought, including Poppy's home background and the fact that the story began with both girls returning to Brighton, scene of the tragic events of their youth. This is the story of two young girls - called the Ice Cream Girls because of a photo of them licking ice creams, taken by their tormentor, the creepy history teacher. He is a thoroughly nasty piece of work and perhaps the main fault of this book is that it is difficult to understand how Serena and Poppy ended up in the dock, accused of his muurder and how Poppy went to prison for it. But that is the whole premise of the book which focuses on the determination of Poppy, newly released from prison, to make Serena confess her guilt and clear her (Poppy's) name. Serena in the book is a far more sympathetic character than her TV persona. Cut down to just three episodes, the TV adaptation also had to trim some of the "side" stories which went such a long way to develop the characters of Serena and Poppy. In particular, the relationship between Poppy and Tina, the woman who helped her survive her long years in jail moved me as much as anything else in the book. This is a story which is easy to read - but not necessarily easy reading. The theme is one of childhood betrayed and youth lost. 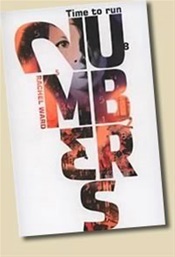 Worth a read - especially if you want to know who REALLY killed the history teacher!